FlexRay is an automotive network communications protocol built to be a deterministic, fault-tolerant bus system. It was developed by the FlexRay Consortium as a conjunction with the leading automotive manufacturers. FlexRay distributes high-speed control for advanced communications systems using dual-channel architecture for system wide redundancy. This function supports systems with safety concerns such as brake-by-wire and steer-by-wire applications. FlexRay is designed for high performance in rugged conditions. Unshielded twisted pair cabling is used to connect nodes in many different wiring layouts. The support of differentiating single or dual channel communication is designed to reduce the effects of noise on the system without increasing the cost by using expensive shielding. Dual-channel FlexRay systems are commonly used to enhance fault-tolerance in the bus and ECU. FlexRay layouts include the Multi-drop Bus, the Star Network, and the Hybrid Network. The Multi-drop Bus topology is the same as in CAN and LIN systems, and it uses a single bus to connect multiple processors together. This system is helpful in implementing with other systems due to the similar layout of CAN and LIN networks. 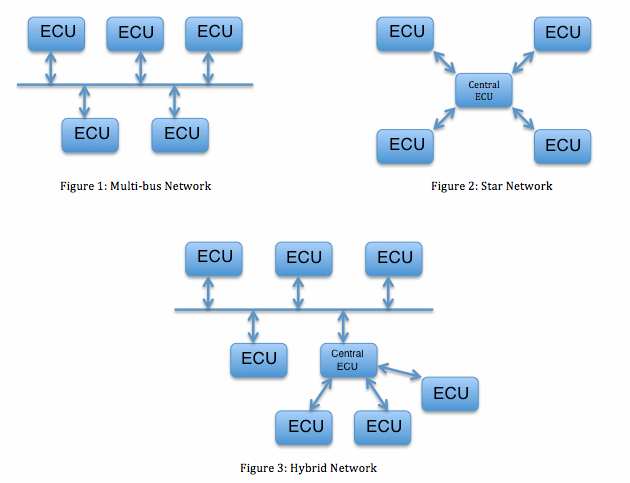 The Star Network topology consists of multiple ECUs connected to a central active node. This layout is useful in that if one processor is cut or disconnected, the other processors continue functioning. The Hybrid Network topology is a mix between Multi-bus and Star Networks. This layout combines the reliability and cost efficient advantages of the other two layouts, and it will most likely be the future of FlexRay technology . Some of the advantages of FlexRay technology are the high-speed communication, fault-tolerance, and the versatile system layouts discussed above. Although FlexRay can be expensive, it ultimately can drive down the costs of communication networks by reducing the number of parallel CAN networks in vehicles. FlexRay Automotive Communication Bus, National Instruments website. FlexRay Communication Systems, Freescale website. Introduction to FlexRay, Vector Academy. Updates or corrections to this web page should be emailed to CVEL-L@clemson.edu. Return to CVEL Automotive Electronic Systems Page.